On Tuesday afternoon the Board of Directors at 3M Company (MMM) announced yet another dividend increase in their long and storied history. The new dividend payout will be $1.175 which is a solid 5.9% increase from the previous payment of $1.11. Through the end of 2016 3M Company had grown dividends for 58 consecutive years giving them the title of Dividend Champion. Shares currently yield 2.67%. Since I own 18 shares of 3M in my FI Portfolio this raise increased my forward 12-month dividends by $4.68. This is the 3rd dividend increase that I've received from 3M Company since initiating a position in 2014. Cumulatively my 3M Company dividends have risen by 37.4% from dividend growth alone! 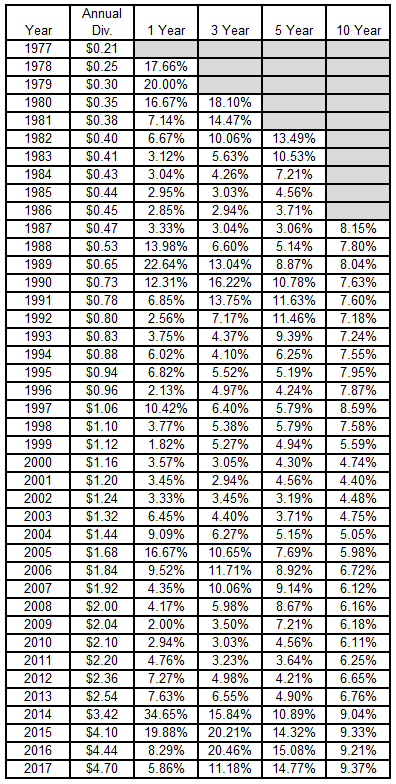 According to USInflationCalculator the total rate of inflation over the same period is just 1.4%. The length of 3M Company's dividend streak is truly impressive. In fact out of all the companies listed on the US stock market there's only 7 companies that boast longer streaks than 3M. As a huge industrial conglomerate 3M's business waxes and wanes with the overall economy, although their size and diversification does provide a buffer such that it's rare for all business segments to do poorly at the same time. As such the dividend growth rate varies with the performance of the company. *2017's annual dividend assumes 3 additional payments at the $1.175 per share per quarter rate. Despite the dividend increase shares of 3M don't appear to be offering up any kind of value at this time. I personally wouldn't feel comfortable adding more shares to my portfolio until the share price retreats back to the low $160's. You can check out my recent analysis of 3M over at Seeking Alpha. My forward dividends increased by $4.68 with me doing nothing. That's right, absolutely nothing to contribute to their operations. Based on my portfolio's current yield of 2.91% this raise is like I invested an extra $161 in capital. Except that I didn't! One of the companies I own just decided to send more cash my way. Thus far in 2017 I've received 4 dividend raises from the companies that I own increasing my forward dividends by $23.25. February should be a busy month for dividend increases with 6 expected raises in total. My FI Portfolio's forward-12 month dividends increased to $5,582.78. Including my Loyal3 portfolio's forward dividends of $67.45 brings my total taxable accounts dividends to $5,650.24. My Roth IRA's forward 12-month dividends are at $243.42. Do you own shares of 3M Company?